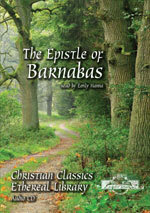 The Epistle of Barnabas is commonly categorized among the Apostolic Fathers alongside the writings of St. Clement, St. Ignatius, and St. Polycarp. This epistle can be dated near the end of the first century and was considered important by many of the early church fathers. It was most likely written to new Jewish believers in response to the growing heresy that the Old Law was still necessary for salvation. A good example of how the early church interpreted the Old Testament, the Epistle of Barnabas explains how the Jewish law finds its true fulfillment in Jesus Christ. Furthermore, according to the author, the Old Law cannot be correctly understood in terms of the physical practice of it, but must be read allegorically toward its fulfillment in the Messiah. It is to be observed that this writer sometimes speaks as a Gentile, a fact which some have found it difficult to account for, on the supposition that he was a Hebrew, if not a Levite as well. But so, also, St. Paul sometimes speaks as a Roman, and sometimes as a Jew; and, owing to the mixed character of the early Church, he writes to the Romans 4:1 as if they were all Israelites, and again to the same Church (Romans 11:13) as if they were all Gentiles. So this writer sometimes identifies himself with Jewish thought as a son of Abraham, and again speaks from the Christian position as if he were a Gentile, thus identifying himself with the catholicity of the Church. The date, object, and intended reader of the Epistle can only be doubtfully inferred from some statements which it contains. It was clearly written after the destruction of Jerusalem, since reference is made to that event (chap. xvi. ), but how long after is matter of much dispute. The general opinion is, that its date is not later than the middle of the second century, and that it cannot be placed earlier than some twenty or thirty years before. In point of style, both as respects thought and expression, a very low place must be assigned it. We know nothing certain of the region in which the author lived, or where the first readers were to be found. The intention of the writer, as he himself states (chap. i), was "to perfect the knowledge" of those to whom he wrote. Hilgenfeld, who has devoted much attention to this Epistle, holds that "it was written at the close of the first century by a Gentile Christian of the school of Alexandria, with the view of winning back, or guarding from a Judaic form of Christianity, those Christians belonging to the same class as himself." Until the recent discovery of the Codex Sinaiticus by Tischendorf, the first four and a half chapters were known only in an ancient Latin version. The whole Greek text is now happily recovered, though it is in many places very corrupt. We have compared its readings throughout, and noted the principal variations from the text represented in our version. We have also made frequent reference to the text adopted by Hilgenfeld in his recent edition of the Epistle (Lipsiae, T. O. Weigel, 1886). Compatibility: This CD is in standard CD audio format (.cda files). You can play this CD in any CD player or computer CD-ROM, or you can rip them to your computer as MP3s.